Let’s get into the meat of the series! Welcome to Section 1, Why You Should Advertise on AdWords, Part 1, How AdWords works. If you missed the introduction, feel free to catch the beginning of the series here. Part 2 will delve into how AdWords benefits small businesses specifically, so stay tuned! Why should you, as a small business owner, consider advertising on AdWords? Before we dive into the intricacies of how AdWords can benefit you, it is helpful to understand the basics of how the system works. 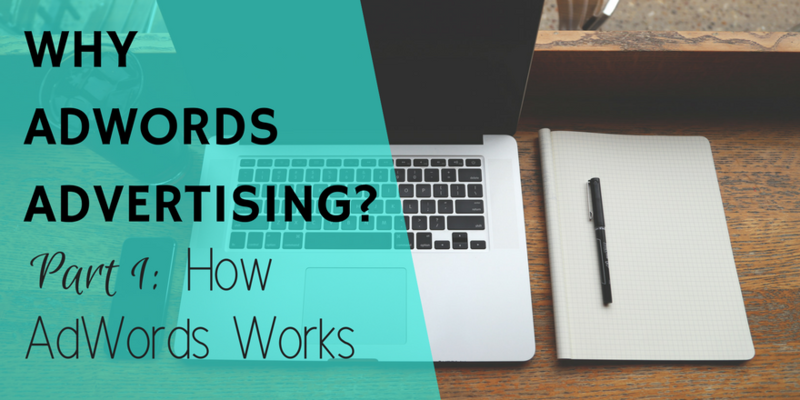 So how does AdWords actually work? Traditional marketing, like billboards, T.V. ads, radio ads, magazine or newspaper ads, etc., require that you pay up-front just for the opportunity to show your ads. You have no guarantee that people will actually read, watch or listen to your ads, or that they will even be interested in what you have to say. On the other hand, AdWords is revolutionary, and here’s why. You only pay when people click on your ads. You don’t have to purchase the privilege of showing your ads upfront, long before you know if you’ll get any benefit from it. Not anymore, not like the old days of advertising. Now, you can run your ads, with very precise targeting, to only show to people who are ALREADY SEARCHING for what you have to offer! The customer is interested in your business, specifically. And you only pay when people actually click on your ad. That’s why it’s called PPC (pay-per-click) advertising. Let’s break down the differences between paid and organic listings. On the average Google search results page, the first 1-4 listings are generally ads; after that appear the unpaid listings, or “organic” search results. Then at the bottom of the page will appear 1-3 more paid listings. Occasionally, you will also have Google maps above the organic listings and business profiles to the right of the search results. Organic listings are based purely on merit. Google considers that user’s search term, search history, and many other factors to choose which websites are most relevant to that user’s needs, and they also consider which websites offer the best user experience and the most relevant information. When you optimize your business website to increase your likelihood of showing up higher in Google’s organic listings, you are practicing SEO, or “search engine optimization.” We recommend SEO material on our resources page. Paid listings, on the other hand, are paid ads. If you run paid advertising on Google searches, you are engaging in SEM, or “search engine marketing”. Theoretically, anyone with a high enough bid and a website of high enough quality could show up first in the Google search results when a particular search is entered, say “moving company near me”. The good news is that we are here to provide a thorough, base of knowledge of AdWords in an easy-to-understand format. We will provide in-depth information regarding every step of the AdWords process to help you become successful with your paid search advertising. By the end of this course you should feel confident in moving forward with SEM for your business. Throughout this course, we will also point you to a wealth of free online resources and education to help you go deeper and learn as much as you want to learn. Say you bid $10 to show up first on a particular Google search, while your nearest competitor bids $20. But, their website is extremely slow and low quality, while your website is very relevant to the search and top-of-the-line. Google may award first position to you with your $10 bid instead of the competitor with the $20 bid, if your quality score is a lot higher than their quality score. Watch this video to get a deeper understanding of how Google’s bidding auction works. Before we go any further, let’s bust a myth. AdWords is not magic. Some sources of information out there will make wild claims that AdWords is a magic bullet, an ocean of free or almost free leads. It’s simply not true. Just like anything of value, good positions in the Google search results cost something. Some Google searches are more valuable for your industry than others. You could, theoretically, advertise on all of these searches. But clearly, some searches are more valuable than others. Someone who searches “tips for moving” might need to hire a mover, but, they may already have a mover – it’s not clear. On the other hand, someone who searches “long distance movers near me” clearly wants to hire for a mover for a valuable, profitable move. Predictably, you will have the most competition from other advertisers on the highest-value searches. The competition bids up the system, and you therefore have to pay more to show up at the top of the page. On lower-value searches, you may have less competition, and thus need to pay less to show up at the top of the page. We’ll dive deeply into strategies for bidding later in the series. For now, remember that, like anything of value, AdWords leads aren’t free. AdWords leads do cost real money. AdWords will be a real expense line-item on your income statement. But when AdWords is run well, the AdWords expense to your business can be wildly profitable for you and help you bring in lots of profitable new business. In the next article, we will delve deeper into how AdWords specifically benefits small business owners. Until then, we hope this information has been beneficial! If it has been, please share this series with your friends and business partners. And remember to subscribe so that you don’t miss the rest of the series! AdWords Specialist at Rothman PPC. Account Manager & Writer. Bookworm.